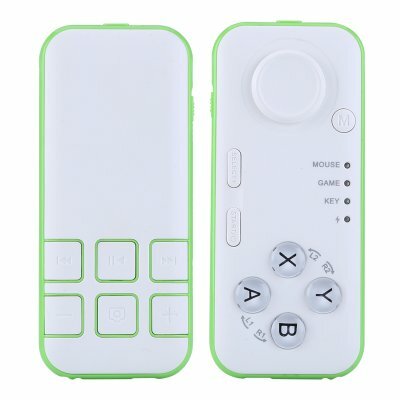 Successfully Added MOCUTE Universal Bluetooth Remote Control - Bluetooth 3.0, Gamepad, Selfie Shutter, Music Control, Wireless Mouse to your Shopping Cart. Bring all your devices under the control of one compact and stylish remote. The universal and multi-functional device can be in charge of your various gadgets, whether Android, iOS or PC. With the MOCUTE Universal Bluetooth Remote Control, you will get one simple gadget to rule all your media. Whether you need a joystick to play a game on your tablet, take a selfie with your Smartphone or a mouse for your PC, the MOCUTE remote control is right there at your service. Hook it up to your Android tablet or iPad and use the convenient gamepad to get the best scores in your favorite gaming apps. Need to work on a project? Pair the universal remote to your PC and use it as a wireless mouse. Want to take a quick selfie at the end of the day? You won’t need a selfie stick, as the MOCUTE remote can also be your phone camera trigger. The remote is fun and easy to use. After you pair it to the device of your choice, you’re set to go. Just use the simple controls on the front and back of the remote to navigate. On the front, you will have your wireless mouse pad key and joystick, as well as indicator buttons for switching between various modes: mouse, game, key, etc. On the back, you will have a nice set of media buttons for playing and skipping through music tracks, triggering your camera and adjusting the volume. The MOCUTE Universal Bluetooth Remote Control comes with 12 months warranty. Brought to you by the leader in electronic devices as well as wholesale universal remote controls, Chinavasion..